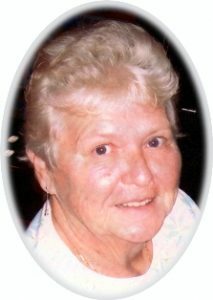 Carol L. Large, age 77, of Colonial Parkway, Saukville, WI passed away Saturday, June 17, 2017 at St. Luke’s Medical Center in Milwaukee after complications of surgery. She was born on February 28, 1940 in Waukesha, WI; daughter of Michael and Catherine Weber Jakubic. Carol grew up in a large family in Lannon, later graduating from Menomonee Falls High School. On June 27, 1959, Carol married Daniel W. Large of Milwaukee at St. James Catholic Church in Lannon. For many years they lived in Milwaukee. Carol worked at the Briggs and Stratton Corporation in Milwaukee, moving the family to Saukville in 1970. Sprague Electric and Martec Industries in Grafton and Philips Electric in Glendale were some of Carol’s former employers. Carol made her house a home. A loving mom, Carol took great pride in her gardening, crafts, and cooking . She especially loved to cook for family and friends. Everyone’s favorites were her chicken dumpling soup, German potato salad and potato pancakes. In the summer she loved to do gardening and fishing. When it came to gardening, she could grow anything. Her rose garden and vegetable garden were her favorite to play in on the days when she wasn’t on the lake fishing for crappies and bluegills. She never shied away from a fishing trip to Madison or Fox Lake. In the winter she loved doing her crafts and going to the casino. After she retired, she and her husband became snowbirds. Even though she loved going to Arizona every winter, she missed her family. Because of this, she and her husband decided to stay home all year–which her grandchildren loved. Carol was noted for spoiling each one of her grandchildren. Carol also loved to travel any chance she had. Her favorite places included Florida and Alaska. She is survived by her husband of 58 years, Dan; her children Dan (Lori) Large and Debra Klein, both of Port Washington; four grandchildren Molly and Jessy Klein and Olivia and Nolan Large. Carol is further survived by her sisters Josie Reise of St. Germain, June (Don) Stampfl of Sun City, AZ, Jean Rynaszewski of Grand Marsh, WI, Mary Brodbeck of Gillett, WI and Marty Van Enkenvort of Slinger; sisters-in-law Lois Letizia of Sun City, AZ and Beverly (Henry) Steel of Milwaukee, nieces, nephews, other relatives and friends. Carol is preceded in death by her siblings Catherine Meyer, Frances Greengo, Eugene and David Jakubic, and an infant sibling at birth. No funeral services will be held. A family gathering will take place in July. Memorials to givers charity of choice appreciated. Previous Post: Radloff, Christine J. Next Post: Swatek, Lillian A.